Vintage French linens with monograms can still be found in French flea markets because the younger generation is selling inherited linens found in armoires, chests, and attics. Could it be that the days of formal meals with trousseau linens gracing a table set for twelve are gone? Is the younger generation opting for more casual meals? Or using linens with THEIR monograms instead of grand-mères'? Most vintage linens are white or ivory, but colored linens are popping up, either as new linens or dyed vintage linens. All three flea markets/brocantes I shopped in Paris had vintage linens with beautiful monograms, and I saw colored linens in two of the three markets. Usually the monograms are what attracts me, but not with this one. The monogram on this table topper is stylistic without discernible letters to my eyes. What caught my attention and made me look at this piece was the beautiful damask Christmas holly pattern. I love Christmas, and I love decorating with holly at Christmas. I couldn't put this table topper down once I picked it up. With the popularity of Fixer Upper, black is a trending color in kitchen countertops, cabinet hardware, metal window frames, and painted cabinets. One of my friends has beautiful black countertops and decorates with black throughout her home. When I saw this beautiful damask table topper at the famous Le Puces Saint de-Ouen at Porte de Clignancourt in Paris I immediately thought of Fixer Upper and my friend. Paris Perfect has an excellent article about Le Puces Saint de-Ouen. 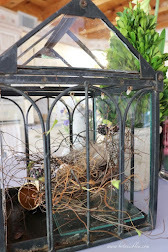 If you plan to shop flea markets while in Paris, I recommend reading her blog post. Oh Happy Day has a great post about HOW TO GET TO Le Puces Saint de-Ouen. She shares practical information about the Paris metro system and photographs of the area surrounding the Porte de Clignancourt metro stop. I'm not sure I could have found the real flea market without seeing her photographs of the Paris neighborhood. Let's talk about modern-day French linens that are beautiful and add a French Country look to kitchens. 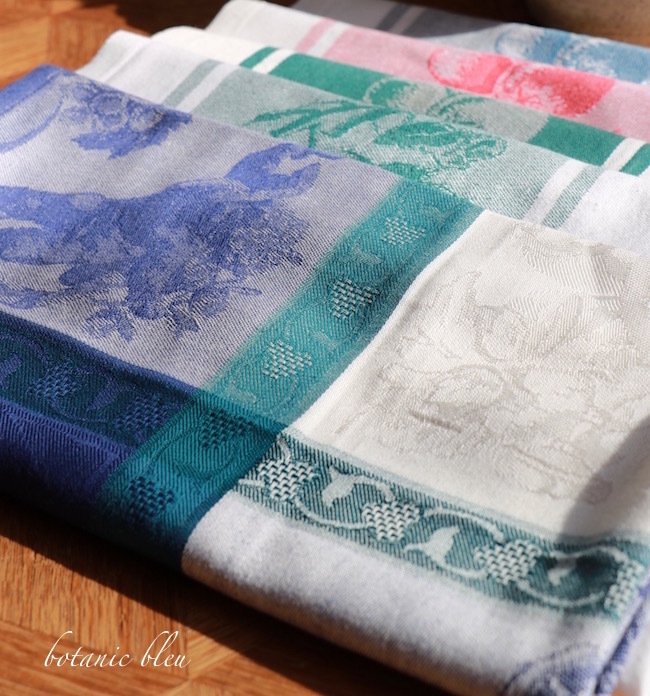 Vintage French monogramed linens are beautiful, but France is still renowned for creating beautiful linens today. Jacquard is a fabric in which the design is woven into the fabric instead of being printed or dyed on. 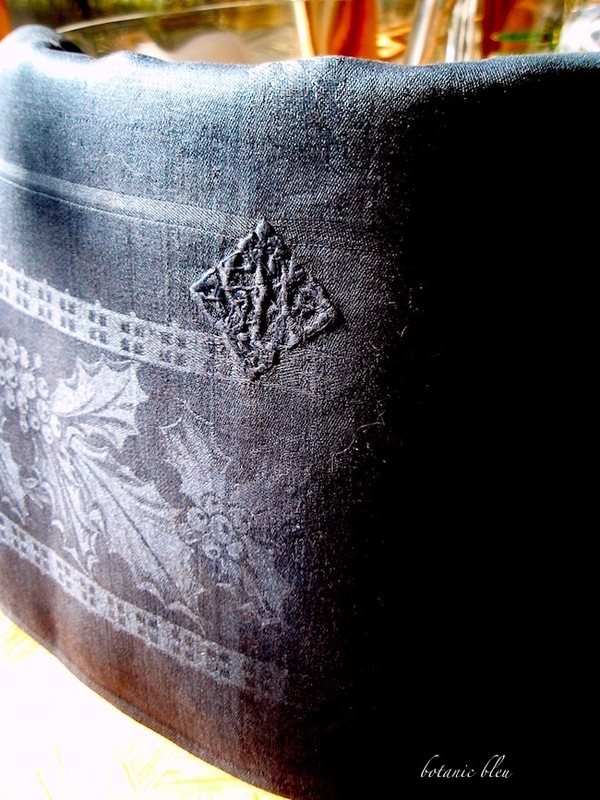 The black holly table topper is damask, one kind of jacquard, in that the pattern is woven into the fabric. 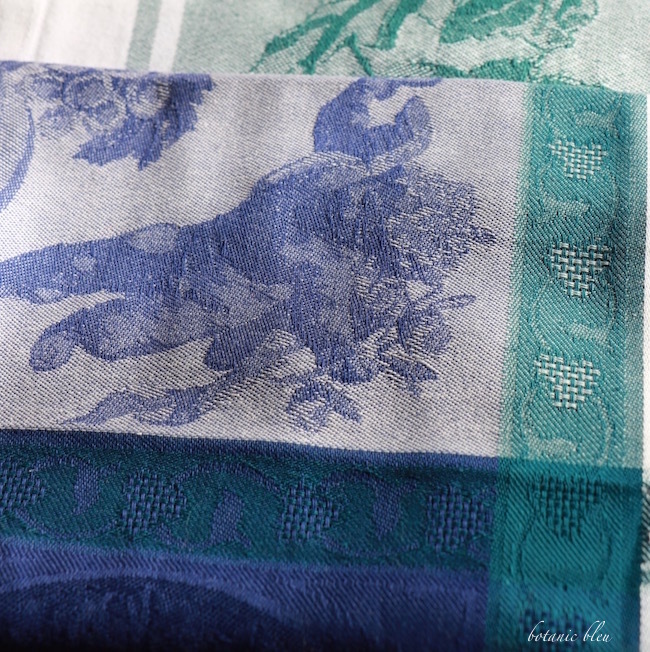 For a more thorough discussion of the differences between damask, brocade and jacquard, see a post written by The Dreamstress. Modern French linens have been catching my attention since the mid 1980s when I first began traveling to France. 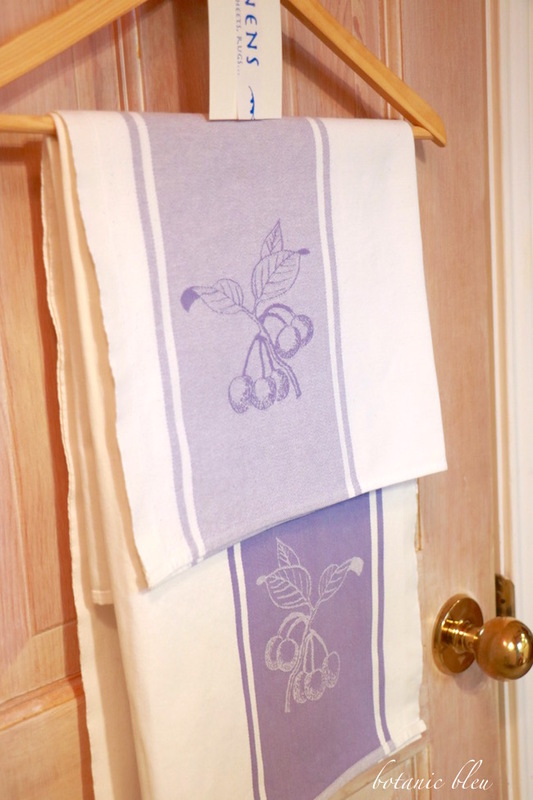 Heavy weight 100% cotton jacquard kitchen towels will be treasured sought-after vintage French linens in the future. Look at the beautiful color of these towels. The jacquard design is visible on both sides because it is woven into the fabric. On one side the pattern is darker than on the other side because the pattern is created with a colored thread mixed with a white thread. Yes, these two towels have the same design, but are folded to show both sides. 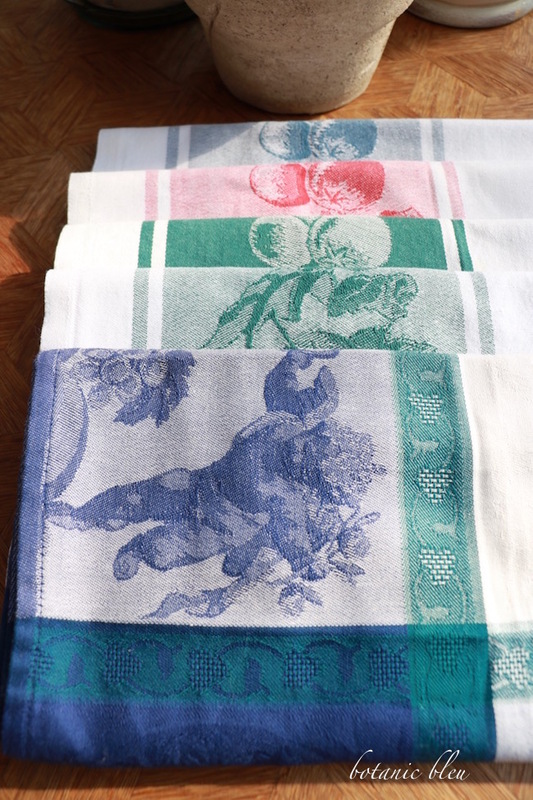 The bleu and green linen on top with cupid is a napkin, and the other four are kitchen towels with a holly and berry design. The napkin is a combination of damask and non-damask jacquard designs. 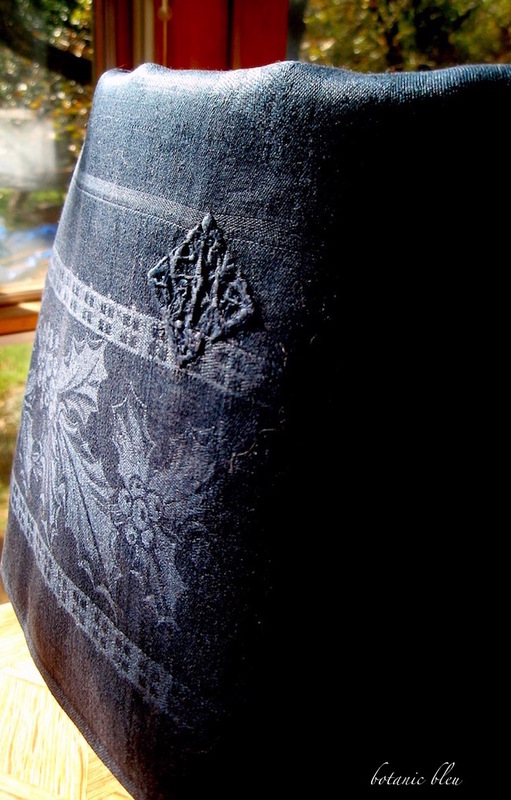 The pattern in the white section is damask, a pattern seen by reflecting the light differently on the fabric. The colored borders and cupid are a different style of jacquard weaving. How do I use these? As accents during special occasions. With Valentine's Day coming soon, the cupid and hearts napkin will be shooting arrows all around my kitchen. What to do with the odd vintage linen napkin or lone kitchen towel? 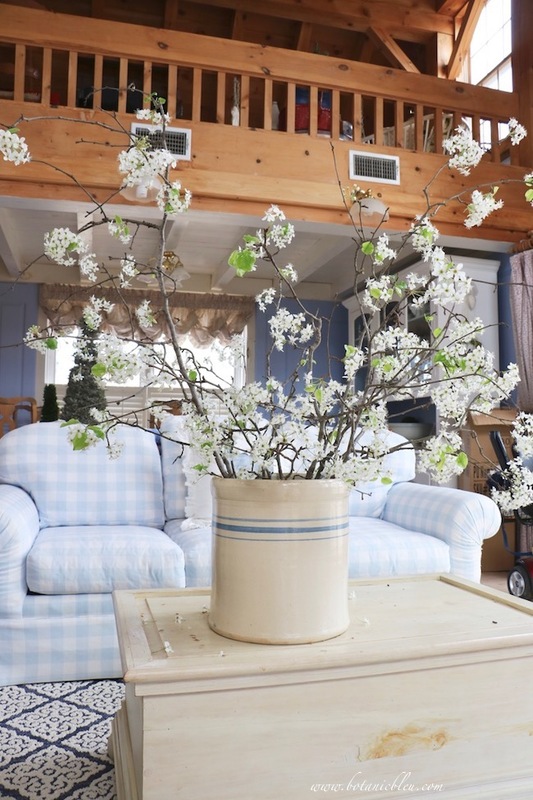 One underneath a table arrangement adds another layer to the centerpiece. Two of the same design laid end-to-end on a table become a table runner. 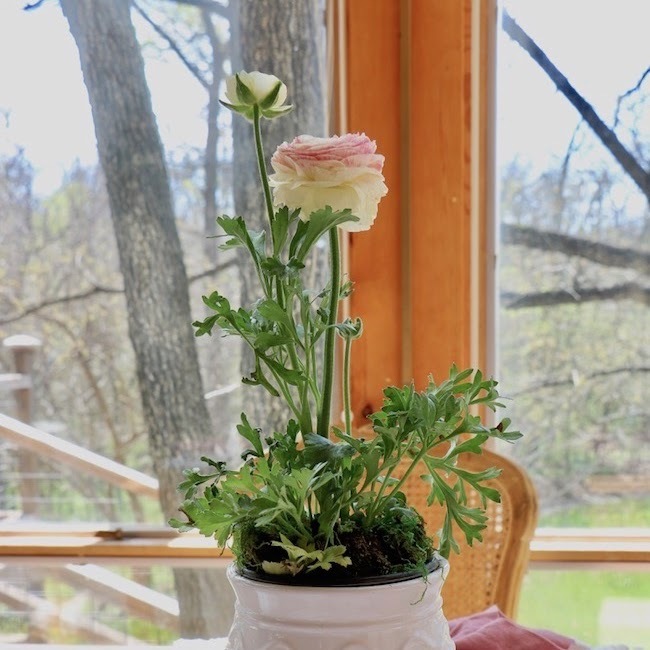 When possible, buy two to use as a table runner or for an intimate table setting for two. Cupid is perfect for a romantic Valentine's meal at home. One works as a liner in a bread basket. Hanging on a kitchen hook, one or two become holiday decorations. One wrapped around serving spoons, ladles, pie servers, etc... keeps them together when transported to a pot-luck dinner. After the meal, wash your serving piece(s), and dry with the towel you brought. No looking around for one from your hostess. Rewrap for taking home. One folded on the kitchen counter with a silver-handled ice scoop on top is a pretty way to use an ice scoop. The towel absorbs water from the scoop after use and can be used to wipe any water from the counter. One draped over the side of an ice bucket holding bottles of wine. The black vintage table topper in the first two photos is used this way. Last... an idea for bloggers... use as a photo backdrop. You have seen this photo styling on most superstar bloggers' posts. Look at the stunning photography from others, and chances are, you will see some beautiful linens used. Copy that style technique shamelessly. Come back each Friday in 2017 for another post in a design series that shows 1] a photo taken in France that illustrates French design and 2] how that design translates into our homes. How do we know what IS French design? When selecting furnishings, lighting, and accessories, how do we decide what to use? 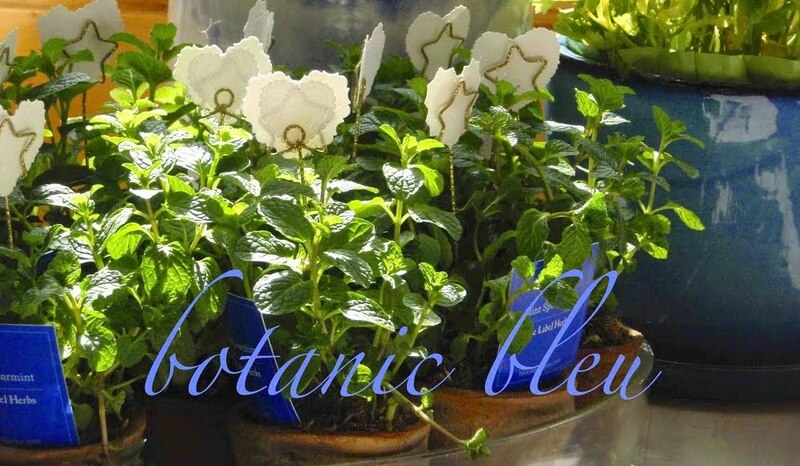 Botanic Bleu will be providing examples straight from France through photos taken by me. Together we will study the photos. a French-inspired garden and home. 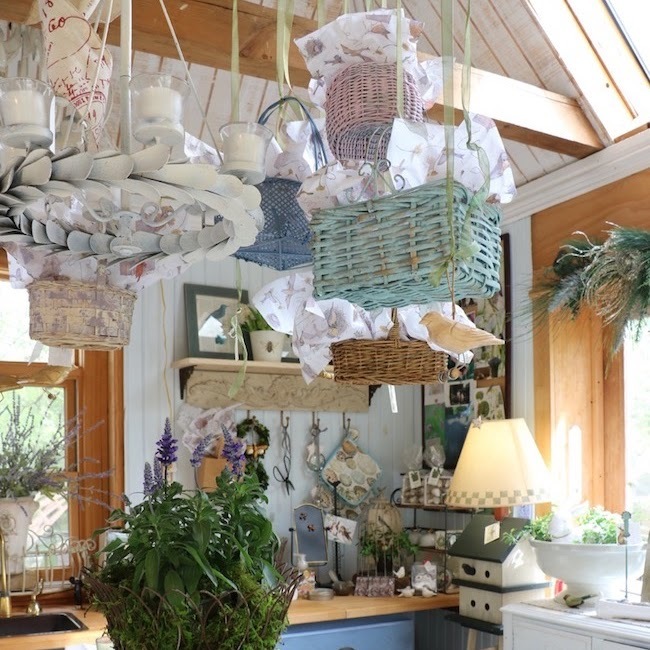 For French Country Design from others, see Botanic Bleu's Pinterest board, French Country Design, and a group Pinterest board to which Botanic Bleu contributes, French Country Decor Ideas. 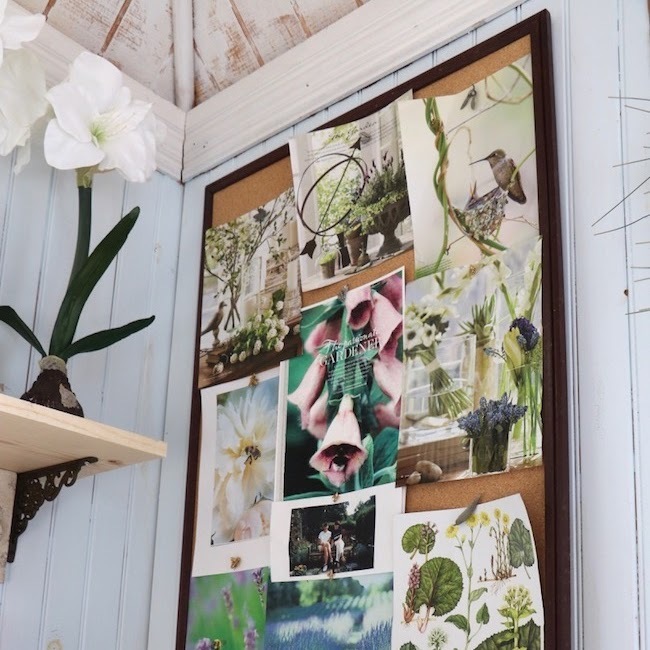 For more French style straight from the source, click on the French Inspiration links in the sidebar to read sites devoted to French joie de vivre. How do you use linens in ways other than their intended purpose? Thank you for all of these delightful ideas. Once again I'm reminded to get my pretty linens out of the drawer and use them around the house to bring joy to our days. 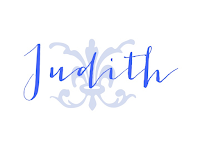 Another beautiful post, Judith. I'm a linen junkie! Once I told a group of friends that I have a bedding addiction. They must have heard "betting ". I've heard through the grapevine I have a problem with gambling! C'est la vie! 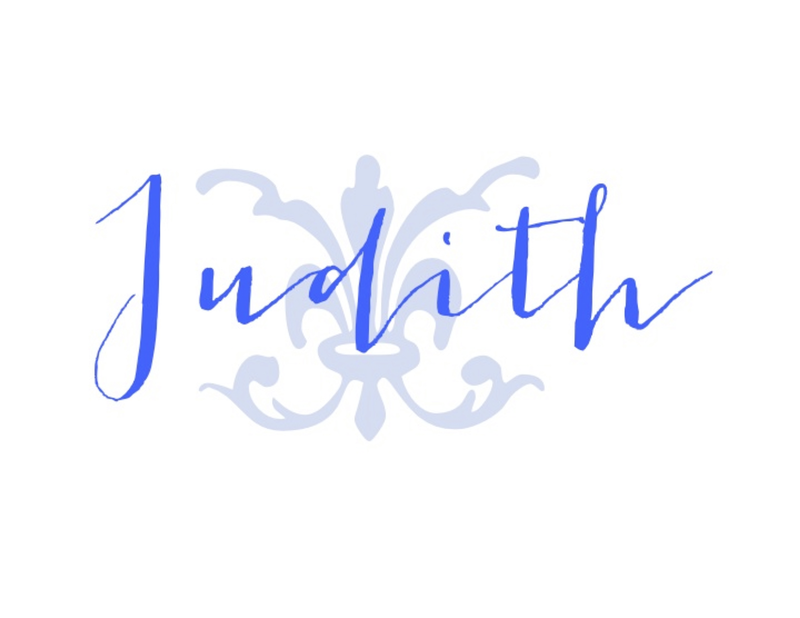 Oh Judith, those linens are just beautiful. I'm enjoying your series very much! I mostly use my linens as decorations for holidays or to line my bread basket. Have a wonderful weekend! This is such an interesting series of posts. Thank you for sharing your knowledge and advice. I really do need to use some inherited linens much more often than I do now! Thank you for the kick-start. I've new French linens too, both for the table and for the kitchen. I'll be using my jacquard cupid linens for a Valentine's dinner party. As for the Paris Market, I often give the same advice as Oh Happy Day. Stay on the same side as the metro until crossing under the overpass at which time one can cross over to Le Puces Saint de-Ouen. I've also learned that returning in a taxi is a good idea, especially if one has packages. The metro is usually packed with riders. A shop owner will usually help call a taxi to their address and pick you up. Must safer and less hassle and not all that expensive. You treat us to such valuable and honest information on French Design. What a gift this is to us. Your linens and photography are absolutely breathtaking and genuine. Such an informative post, Judith. I love jacquard, damask, and brocade. 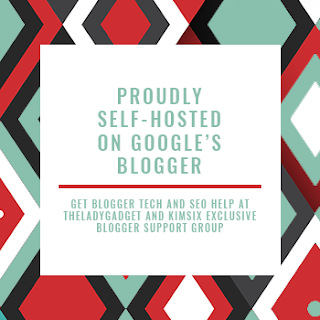 I'll be viewing the link you shared. I have so much to learn from you. I've been to Paris four times and haven't been to the flea market. I would LOVE to go. Great tips to study for a future time maybe. I regret not buying a La Jacquard Francais tablecloth in Strasbourg In September. The prettiest part of dish towels are hard to display to enjoy the most decorative part.